EDITOR NATIONAL TRIBUNE: I saw in one of your issues a statement by Col. Bennett that Gen. [George] Stannard, with his brave Vermonters, charged and took Fort Harrison Sept. 29, 1864. Now, I positively say that is not the case. 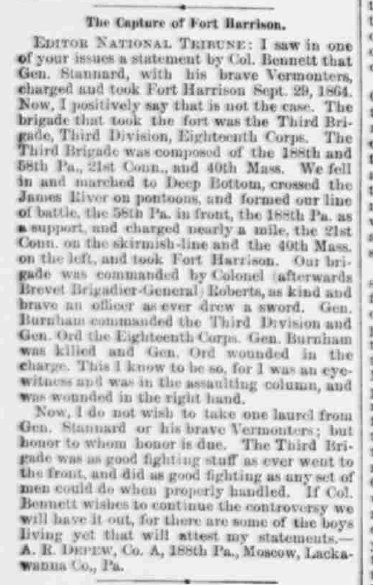 The brigade that took the fort was the Third Brigade, Third [sic, First] Division, Eighteenth Corps.1 The Third Brigade was composed of the 188th [Pennsylvania] and 58th P[ennsylvani]a., 21st Conn[ecticut]., and 40th Mass[achusetts]2. We fell in and marched to Deep Bottom, crossed the James River on pontoons, and formed our line of battle, the 58th P[ennsylvani]a. in front, the 188th P[ennsylvani]a. as a support, and charged nearly a mile, the 21st Conn[ecticut]. on the skirmish-line and the 40th Mass[achusetts] [sic, 92nd New York]. On the left, and took Fort Harrison. Our brigade was commanded by Colonel (afterwards Brevet Brigadier-General) Roberts, as kind and brave an officer as ever drew a sword. Gen. [Hiram] Burnham commanded the Third Division [sic, First Division, and he did NOT command the division, Stannard did] and Gen. [Edward O. C.] Ord the Eighteenth Corps. Gen. Burnham was killed and Gen. Ord wounded in the charge.3 This I know to be so, for I was an eyewitness and was in the assaulting column, and was wounded in the right hand.